Tackling over-collection of wild plants - is horticulture a conservation problem or solution? This symposium was held at the 2017 ICCB conference and was organised by Dr Lauren Gardiner (Royal Botanic Gardens, Kew) and Dr Amy Hinsley. Although much conservation attention is paid to charismatic megafauna, one in five of the world’s almost 400,000 plant species is threatened with extinction. Of those, IUCN data shows that more than 20% are directly threatened by collection from the wild for subsistence use or trade, including for food, building materials, medicine and as ornamental plants. Horticultural techniques that have been developed over thousands of years to grow crop plants and living collections in botanical gardens have long contributed to the ex situ conservation of plants around the world. Yet horticulture can also be a threat: many rare plant species have been collected to extinction for the horticultural trade, and encouraging propagation of useful plants is an often suggested solution to over-collection, but one that may actually increase wild-collection. 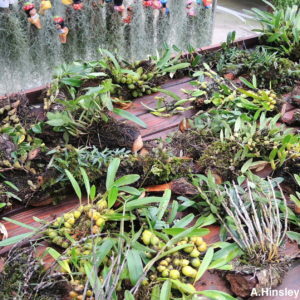 This symposium brought together experts from research and practice to present experiences and viewpoints, from different disciplines, of the role of horticulture in preventing over-collection of wild plants and securing their representation in ex situ collections. Speakers included anthropologists working on sustainability of subsistence use, botanists and conservationists who specialise in different groups of threatened plants, as well as practitioners who work closely with horticultural traders and corporations using wild plant material. Are private horticultural collections species' saviours or drivers of extinction? Ex situ conservation of succulent plants: examining tensions in horticulture. Seed banking and horticulture: complementary tools for the conservation, restoration, and increased genetic diversity of wild plants. Horticulture as a strategy for in situ and ex situ orchid diversity conservation in the Andes. Can cultivation of the economically valuable Xate palm take pressure off its wild populations? Horticultural propagation versus wild collection for commercially viable yields.